I attended a tea party recently– the best kind of tea party, with tiered servers and tiny sandwiches and itty-bitty desserts of all kinds– so of course I had to bring something of my own to contribute. The more elaborate dishes were already taken care of, so I thought it would be nice to have a plateful of relatively simple tea cakes on the table. I immediately thought of friands and financiers– two traditional French cakes made with almond meal that I’ve always wanted to try– but the guest list included some nut allergies, so those were out. Still, I figured that I could use brown butter (another traditional component of French cakes) for flavor and a high sugar content to get a touch of chewiness, and with a little searching found a recipe that I thought might work as a base. Hi. I’m Tanya, and I’m addicted to projects. They’re usually small and cute, but occasionally get a bit out of hand, as my friends and family can testify. By way of background, past projects include The Great Hat Undertaking of 2009-2011, 31 Days of Halloween, various costumes and themed parties (adult and child), the development of a petit four/mooncake hybrid (still not perfect), and The Mean Doll (so named by my 3-year-old). I’ll be posting about those later, I promise! 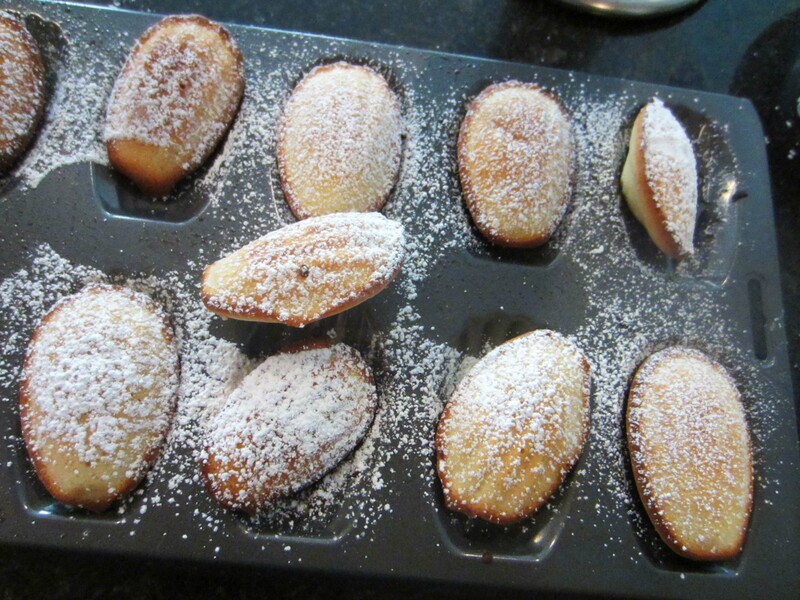 For my first post, however, I decided to start small, with madeleines. Yes, yes, everyone knows about Proust and madeleines, how they were supposedly this transcendent experience when dunked in just the right tea, but I mostly wanted to try making them because they were pretty. Off to the internet I went, recklessly purchasing a set of madeleine pans (I’d never even tried them at this point, remember) and trying to find the perfect recipe. I tried one that looked promising, but it was such a failure I won’t even post the link to the recipe. Suffice it to say that it had almost twice as much butter as recipes I found later (surprisingly, not a good thing), and fell flat in every sense of the word. Greasy, flat, boring– I threw them out, and went in search of more recipes. Recipe #2 turned out gorgeous. Just beautiful. Golden, fluffy, slightly crisp around the edges. When dusted in powdered sugar they could’ve been on a magazine cover. And they tasted good, with good vanilla flavor (using my homemade vanilla extract– another project). But the fluffiness lacked textural interest, and after sitting overnight in a ziploc bag they lost all of that slight crispness on the outside edges that made them at all interesting. Not ideal. Recipe #3 turned out less than gorgeous, but it was probably my fault. Rather than go to the trouble of mixing some of the brown butter with flour and painting the insides of the molds, I took a shortcut and just sprayed the molds with baking spray. The result was unevenly browned madeleines, which were pasty in some spots and over-browned in others. However, the flavor was still good (especially with the browned butter), and the texture, even after days in a plastic bag, was almost perfect. 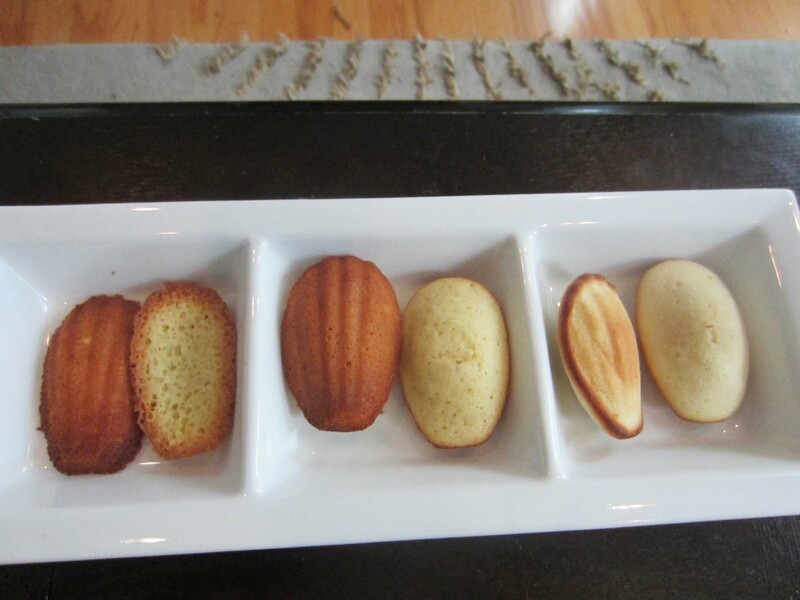 The madeleines were dense, with an outer “crust” that provided a really nice contrast to the inside softness. Importantly, the crust didn’t soften over time. You can see how flat the initial recipe was– a consequence of too much butter. The middle one was much better, and the last was unevenly browned. None were perfect. Since I wanted to keep the crust but lighten up the crumb a bit, I decided to try #3 again, this time adding a mere 1/4 tsp. of baking powder, and actually doing the “paint the molds with butter” thing. Results? Perfect. These baked up perfectly golden, rising higher than the original recipe but still with a nice bite to them, and (best of all) required no special equipment to mix up. They slide right out of non-stick pans, so watch out when you go to unmold them– it would be a shame to lose one! Melt the butter in a saucepan and boil until it browns very lightly. Set aside 1 1/2 tablespoons of the browned butter and stir in the tablespoon of flour. Cool the remaining butter to room temperature, using a water bath or refrigerator. Mix flour, sugar, baking powder, and salt in a bowl and add three quarters of the beaten eggs, plus vanilla and lemon zest/juice if using. Beat vigorously with a wooden spoon until smooth – if very stiff, add a little bit of the remaining egg. Set aside for 10 minutes. Beat the remaining bit of egg into the batter and stir in the cool butter. Cover the batter, and refrigerate for at least one hour. When ready to bake, preheat the oven to 375. Paint the Madeleine molds with a light coating of the browned butter and flour mixture, wiping up any pools that form in the bottom. 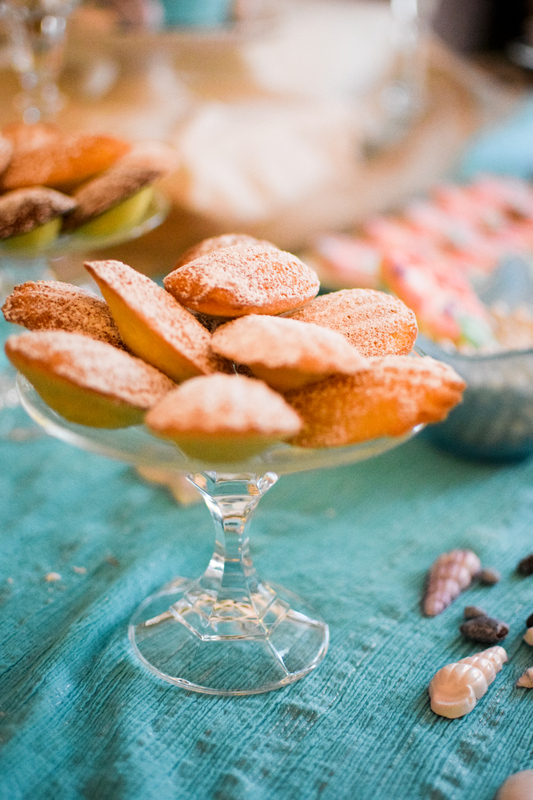 Using a spoon or piping bag, drop a rounded tablespoonful of batter into each Madeleine mold. Do not spread the batter to fill the mold. Set pans on the middle rack and bake for about 10-12 minutes, until edges are golden brown. (if they won’t fit on one rack, put them in the upper and lower thirds of the oven, and rotate halfway through) Unmold onto a cooling rack. When completely cool, dust with powdered sugar.